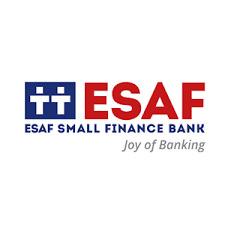 ESAF Bank Recruitment 2018 | 3000+ Various Post Vacancies : ESAF Small Finance Bank has published recruitment notifications for Branch Heads, Assistant Branch Heads and various Officers for filling up above 3000 vacancies. More information please read below mention Official notification carefully. Education qualification : Graduation / Degree or Post Graduation in any discipline from a recognized University and a minimum of eight years of experience in banking as Branch Head. Education qualification : Graduation or Post Graduation in any discipline from a recognized University and a minimum of 05 years of experience in banking as Assistant Branch Head. Education qualification : Graduation or Post Graduation in any discipline from a recognized University and three years of experience in sales (Sales experience in Banking/ Financial products/ Telecom/ FMCG/ Hospitality) is preferred. Candidates must possess a flair for sales and marketing. Education qualification : Graduation or Post Graduation in any discipline from a recognized University and two years of experience in banking, NBFC, hospitality or any other financial streams. Education qualification : Graduation / Bachelor’s degree in any subject from a recognized University and must possess one year experience in credit appraisal. Education qualification : Post Graduate degree in any discipline from a recognized University without any backlogs or Graduates with one year sales experience. Candidates must possess a flair for sales and marketing. Students awaiting results can also apply. Experience in Asset and Liability. 8+ years experience. Age Limit: Minimum 21 Years and not above 40 Years as on 30th April 2018. experienced bank employees and senior officers. How to Apply: Apply online through ESAF Bank Careers site. The last date for submission of online applications is 21/05/2018. The last date for submission of online applications is 21/05/2018.